Property worth lakhs of rupees was gutted in a major fire which broke out on the premises of the Anand Nishikawa factory on the Chandigarh-Ambala road, near here, this evening. 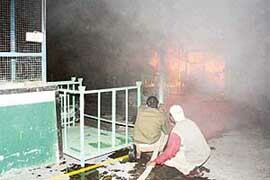 Firemen struggle to extinguish a fire, which broke out on the premises of the Anand Nishikawa, near Lalru, on Monday. — Photo by Sarbjit Bhatti. In its overdrive to teach traffic rule violators a lesson, a police jeep following a violator, banged into his motorcycle, thus injuring the violators. With the Congress, BJP-SAD alliance and the Chandigarh Vikas Manch (CVM) candidates filing their nominations for the post of city Mayor today, a triangular contest seems likely in the election to be held on January 1, 2006. Bhavana Prakash was crowned Ponds’ Googly Woogly Princess by Pond’s Femina Miss India Asia Pacific 2005 - Niharika Singh at Hotel Mountview today. Bhavana received a gold crown along with a hamper of Pond’s skincare products. Officials of the Excise Department of Chandigarh Administration today issued a notice to the organisers of the 89th conference of the Numismatics Society of India hosted by the Panjab University’s Department of Ancient Indian History and Archaeology. 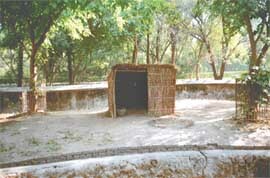 With the night temperature dipping to around 5°C, the Mahendera Chaudhary Zoological Park, Chhatbir, authorities have provided cosy cover to its denizens. The animals from warm tropical areas like the big cats are being accorded special attention. Global warming has taken its toll even on a city like hours lying at feel of the Shivalik hills. Winter now takes a long time to come here. But Christmas morning was certainly a foggy one in the city. Instead of grumbling about the fog, Chandigarhians are actually welcoming it. Sticking to its decision to hike water and sewerage charges, the Department of Local Government, Punjab has rejected the proposal of the local Municipal Council to impose a stay on the increased charges in the town. Four electric poles in the middle of road in the Phase IX Industrial Area here are posing a serious danger to traffic. The UT Red Cross today inaugurated the second phase of the “Raen Basera” at the Inter-State Bus Terminus (ISBT) in Sector 17 here. After four days of disruption in air and rail traffic in the city due to fog at Delhi, the weather finally improved today and flights resumed to the city. The Air Deccan flight, however, was not operational for the fifth day today. A purse containing Rs 1 lakh and other articles worth Rs 50,000 was stolen from a restaurant in Sector 17 this afternoon. Ms Sukhla Gupta of the UK lodged a complaint that her purse was stolen from Sagar Ratna. Ms Gupta had come to the city for shopping along with her Khanna-based sister. A case of theft has been registered. The local police today arrested three bus conductors of Chandigarh Transport Undertaking (CTU) on the charge of thrashing a senior assistant of the department on December 12. The special staff of Panchkula police, has recovered cash and stolen goods worth Rs 65 lakh, besides nine cars from Ravinder Singh. A person decamped with Rs 20,000 after breaking the window of a van here today. Students of Sacred Souls School, Gharuan near Kharar, took part in a function organised to celebrate Christmas. The school was decorated with buntings, stars, a Christmas tree and balloons. A skit depicting the birth of Christ was performed by students. Students of the NSS wing of Government college are working on a project to study the contribution of the industry of the town. The silver jubilee batch of the Dev Samaj College of Education, Sector 36, here met the President of India Dr A.P.J. Abdul Kalam, in New Delhi on December 23. The students accompanied by the college chairperson, Ms Satyawati, and the Principal Dr Satinder Dhillon. spent 45 minutes with the President. Students of Dev Samaj College of Education, Sector 36, with the President of India, Dr A.P.J. 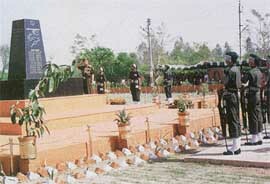 Abdul Kalam, in New Delhi. A-10-day NSS camp concluded yesterday at Government Model Senior Secondary School, Sector 33, here. Held under the guidance of Mr Nirmal Singh and Ms Arti, eminent persons from various walks of life gave lectures on different issues. Participating in the ongoing NSS camp, volunteers of the Rayat and Bahra College of Education, Sahauran, installed submersible pump worth Rs 38,000 in government school in the village. 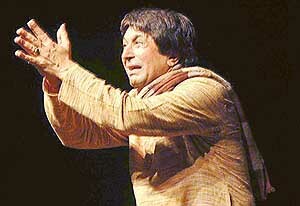 Behind all artistic creations there exists an emotional urge to express in some form, the vaguely felt or perceived experiences and the noted cine star and thespian Mangal Dhillon had veritably relied on the powerful medium of theatre to share his anguish through his creative artistic presentation of a play ‘Theatrewala urf Pagal’ staged at the Tagore Theatre today. “Bhar Gaya Hai Zakhm-e- Jigar Uska Nishan Baaki Hai, Bhujh Gyi Aag Magar Uska Duaan Baki Hai” in the mellifluous voice of Hemant Kumar and “Mein Iss Umeed Se Sooba Tha Ke Tu Bacha Lega.” by classical vocalist Amritpal Singh lit up the musical soiree organised by the Chandan Memorial Society at the Hindu Secondary School hall, Kalka. Chandigarh will soon have another documentary on the city. To be shot this month, the film titled, “Chandigarh Calling” is a first person account of the story of the making of Chandigarh, its world famous architecture, basic plan, culture, tourism, industrial and economic growth and the character of the “City Beautiful”. A free eye and medical check-up camp was organised by the Youth Welfare Sports and Health Club at the Munna Lal Puri Government School, Mullanpur Garibdass, today. In addition to the check-up free eye drops and medicines were also distributed. Among those present on the occasion were Mr S.S. Randhawa, DPI Schools, Punjab, Wing Commander Aswani Kumar from Air Force Station, Mullanpur and Cabinet Minister Jagmohan Singh Kang. A free osteoporosis awareness and detection camp for the central government employees was organised today at the Kendriya Sadan by the Central Government Employees Welfare Coordination Committee. Hosts Chandigarh got the better of West Bengal by three goals to nil but could not prevent the latter from getting a green card on the penultimate day of the All-India Football Federation Under-14 Soccer Festival being organised by the Chandigarh Football Association at the Punjab Engineering College grounds, Sector 12, here today. During his annual official visit to the Rotary Club SAS Nagar, the Rotary Governor, District 3080, Mr Ranbir Singh, inaugurated “Rotary Badminton Court” here. The Fort Ramgarh YMCA Total Tennis Championship began this morning at the YMCA Total Tennis Academy, Sector 11. The championship was inaugurated by Mr Pawan Kapoor, international tennis player. In the boys section, under-10, under-14 and under-16 matches in the first round were played. 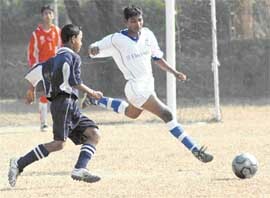 Players from various parts of the region have converged on Chandigarh to participate. Students of Vivek International Public School, Housing Board Colony, Phase III, Baddi (HP) celebrated Christmas with great enthusiasm. A classroom decoration competition was held and the best decorated room was adjudged by Mrs Sushma Sanwal. She appreciated the efforts made by the students and teachers and gave then valuable suggestions. Students sang carols in colourful dresses and Santa Claus distributed sweets. The vice-chairman of the Punjab State Industrial Development Corporation (PSIDC) today laid the foundation stone of a ambitious project to widen the 8-km Dera Bassi-Chadyala road.